The true Shrikes are a widespread group of medium-sized predatory songbirds with hooked bills recalling raptors. Most are patterned crisply in gray, black and white but some include swathes of bay or chestnut. Most true shrikes are birds of open country; an example is the widespread Loggerhead Shrike (left) of western North America. Some species are migratory but others in the tropics are resident. 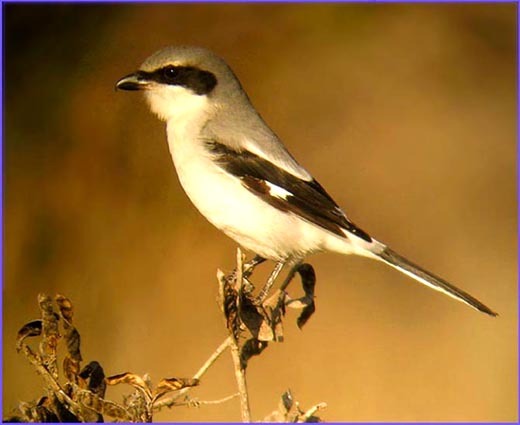 The Loggerhead Shrike is both: northern populations are migratory while many southern populations are not. All but four of the Laniidae are assigned to the genus Lanius. All are generally solitary, monogamous, territorial birds. They feed mostly on larger insects, like grasshoppers, but also small vertebrates such as mice and lizards. Some species impale their prey on thorns or barbed wire for later retrieval. Their rapaciousness is legendary. A set of five shrikes from the African grasslands are called fiscals "from their rapacity, which no revenue-officer could exceed" (Fry & Keith 2000). The Masked Shrike (right) of Asia Minor is among the most lovely. It breeds locally from Greece to Iran and winters to n.e. Africa and Arabia (this one photo'd on winter grounds in United Arab Emirates). The Bay-backed Shrike (below) of dry thorn-scrub country on the Indian subcontinent and west to Iran, north to s. Russia, is one of those. It, like almost all the species in the genus, has a black mask (ear-coverts, lores & often forecrown) and is crisply patterned in gray, black and white. The young of many species, though, are barred with brown and much less conspicuous. They are all sit-and-wait predators, swooping down from elevated perches to grab prey on the ground. These patterns and behaviors are common among the Lanius shrikes around the world. Three examples are shown below: the Isabelline Shrike (left), which has a long migration from w. China or c. Asia to e. Africa (shown here on spring migration atop a sprinkler head at a camel race track in the U.A.E. ); the Southern Gray Shrike (center), a desert specialist once lumped with the boreal Northern Shrike L. excubior which is resembles (shown here in the Sinai); and Somali Fiscal (right), which is an Africa endemic restricted to northeastern Africa. Interestingly enough, when I took this fiscal photo back in 1981, we identified it (using the primitive field guides then available) as Taita Fiscal Lanius dorsalis. It wasn't until almost 20 years later, when I was looking at the new field guide (Zimmerman et al. 1996), that I noted the white tip to the tertials and the shorter tail that identify it as the Somali Fiscal. As recently as the 1990s, true shrikes were considered to be close relatives of Bush-Shrikes (Malaconotidae), Helmet-Shrikes (Prionopidae), Vangas (Vangidae), and the Batises & Wattle-eyes (Platysteiridae). Indeed, much of the older literature lumps these groups with the Laniidae. Harris & Franklin (2000) published a major family tome whose premise was that these groups were each others' closest relatives. Some authors (e.g., Sibley & Ahlquist 1990, Sibley & Monroe 1990), working with DNA-DNA hybridization, placed the helmet-shrikes with the wattle-eyes and the vangas, in a single "tribe" of the bush-shrike "subfamily" within a bulging corvid assemblage. Clements (1991), although heavily influenced by Sibley's work, separates out the vangas but then lumps helmet-shrikes and wattle-eyes with bush-shrikes. Collar et al. (1994), following suggestions of Dowsett & Dowsett-Lemaire (1993), lumped the helmet-shrikes and bush-shrikes with the world's regular shrikes in the Laniidae, but separated out the vangas, and placed the wattle-eyes some distance away near the monarch-flycatchers! It was all very confusing. Relationship are now much better resolved. Fuchs et al. (2004), working with DNA sequencing, found that all the 'bush-shrike' families [e.g., Bush-Shrikes (Malaconotidae), Helmet-Shrikes (Prionopidae), Vangas (Vangidae), and the Batises & Wattle-eyes (Platysteiridae)] grouped together as a real evolutionary unit, but the same sort of biochemical evidence shows that the true Shrikes (Laniidae) are not their closest relatives (e.g., Barker et al. 2004). Rather, although both groups are "core Corvoidea," the true Shrikes are more closely related to Crows and relatives [Corvidae], while the Bush-shrikes are more closely related to Wood-Swallows and Butcherbirds, among others. Apart from the 26 species of Lanius shrikes around the world there are two shrikes assigned to monotypic genera in Africa: the Yellow-billed Shrike Corvinella corvina of west Africa (and extending in a narrow sub-Saharan band east to w. Kenya) and the Magpie Shrike Urolestes melanoleuca (left) of s.e. Africa. Both have very long tails but the Magpie Shrike has a particularly striking one. They is also unique in its vocal duets, their cooperative breeding behavior, and their gregariousness (both Yellow-billed and Magpie shrikes often travel in groups of a dozen birds). They do not impale prey like Lanius shrikes. Likewise, the two African species of Eurocephalus shrikes are also distinctive. Most recent authors (e.g., Fry & Keith 2000, Dickinson 2003) place them among true shrikes (in the Laniidae), but Zimmerman et al. 1996 point out that they build neat, compact, well camouflaged nests like helmet-shrikes (and unlike the other true shrikes in Africa), and that they have scutellation extending down the sides as well as the front of the tarsus, unlike true shrikes. They are generally sedentary, occurring primarily in pairs or small family groups instead of restless flocks, and they take their prey primarily from the ground. In this latter behavior, they are, indeed, shrike-like. The two populations were once combined as one species, but all recent authorities now split them between the east African birds (Northern White-crowned or White-rumped Shrike, below left) and the southern African birds (Southern White-crowned or simply White-crowned Shrike, below right). Photos: The Loggerhead Shrike Lanius ludovicianus was digiscoped at the Big Sur River mouth, Monterey Co., California, on 5 Dec 2004. The Masked Shrike L. nubicus was photographed in Abu Dhabi, United Arab Emirates, on 7 Mar 2001. The Bay-backed Shrike L. vittatus was inside the Tiger Moon Resort near Ranthambhor, Rajasthan, India, on 25 Mar 2001. The Isabelline Shrike L. isabellinus was at the Al Wathba camel track, United Arab Emirates, on 6 Mar 2001. The Southern Gray Shrike L. meriodionalis was on the Sinai Peninsula in Oct 1981. The Somali Fiscal L. somalicus was in Samburu Nat'l Park, Kenya, on 14 Nov 1981. 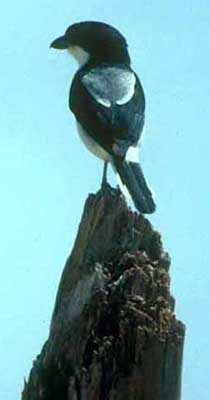 The Magpie Shrike Urolestes melanoleuca was in Kruger Nat'l Park, South Africa, on 30 July 1996. 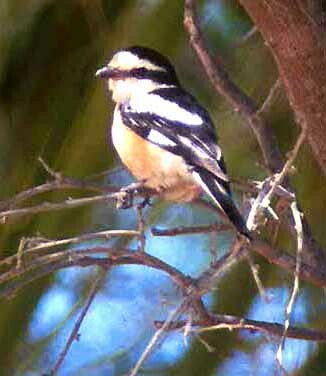 The White-rumped Shrike Eurocephalus rueppelli was in Tarangire Nat'l Park, Tanzania, in August 2002. The White-crowned Shrike E. anguitimens was in Etosha Nat'l Park, Namibia, on 29 July 2005. All photos © 2005 Don Roberson; all rights reserved. There are two family books in the Helm series. The newest is Harris, Tony & Kim Franklin (2000) Shrikes & Helmet-Shrikes. it is discussed next. An earlier book focused just on this family: Lefranc, Norbert and Tim Worfolk (1997) A Guide to Shrikes of the World. Alas, I have not yet reviewed this book in any detail but my first impression in a book store was positive. In addition, the Laniidae section in the Birds of Africa series (Fry & Keith 2000) has a excellent introduction to the African species. This is a very attractive offering in the Princeton bird families series. Tony Harris wrote the text; Kim Franklin did the plates. It has the familiar layout of plates altogether in the front, with range maps and i.d. summary, and detailed species accounts in the back. It looks well researched and has a good bibliography. I very much enjoyed the full-page spreads, with black-and-white sketch, on each genus in the groups covered, that highlights the introduction. There is a lot of discussion of taxonomy but, unfortunately, the authors chose to follow the Sibley & Monroe (1990) approach of only two families: shrikes [Laniidae] and bush-shrikes [Malaconotidae]. All of the batises, wattle-eyes, helmet shrikes, and such things as flycatcher-shrikes, wood-shrikes, and philentomas, are thrown into the latter family. New research does not support this approach. As it turns out, the true shrikes are not the closest relatives to the rest of this set (e.g., Barker et al. 2004), so even the premise of this book proves false. Further, vangas (not included in this book) are closely related to the rest of the group. Indeed, it appears that the flycatcher-shrikes are vangas, and that helmet-shrikes are very closely related to vangas. The text also suffers from the author's use of the "Species Recognition Concept" as his definition for species; fortunately, in practice, in works rather like the tried-and-true "Biological Species Concept." Yet both in its language and in its reliance on DNA hybridization evidence (Sibley & Ahlquist 1990), this book has the unfortunate status of being out-of-date taxonomically much more quickly than would be anticipated. Collar, N. J., M. J. Crosby, and A. J. Stattersfield. 1994. Birds to Watch 2: The World List of Threatened Birds. Birdlife Conserv. Ser. 4. Birdlife Intern'l, Smithsonian Inst., Washington, D.C.
Fry, C. H., and S. Keith, eds. 2000. The Birds of Africa. Vol. 6. Academic Press, London. Zimmerman, D. A., D. A. Turner, and D. J. Pearson. 1996. Birds of Kenya and northern Tanzania. Christopher Helm, London.